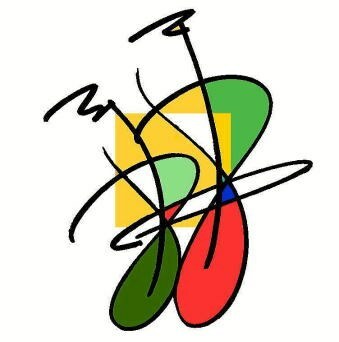 Classical Flamenco & Latin Jazz, Original Music Composition in World Music. Making you and your guests happy with our performance is our No,1 priority. We were selected as the only Flamenco players to perform for Dave Koz (SAXOPHONIST AND COMPOSER) on the Dave Koz' Cruise. Also twice opened concerts for the most famous Jazz Trumpet player, Chris Botti. Javid and Naoko is a Modern Flamenco ensemble comprised of a husband and wife guitar virtuosos Javid & Naoko. Exquisitely original guitar compositions instilled with the intense energy of the heart and the fiery passion of the soul. 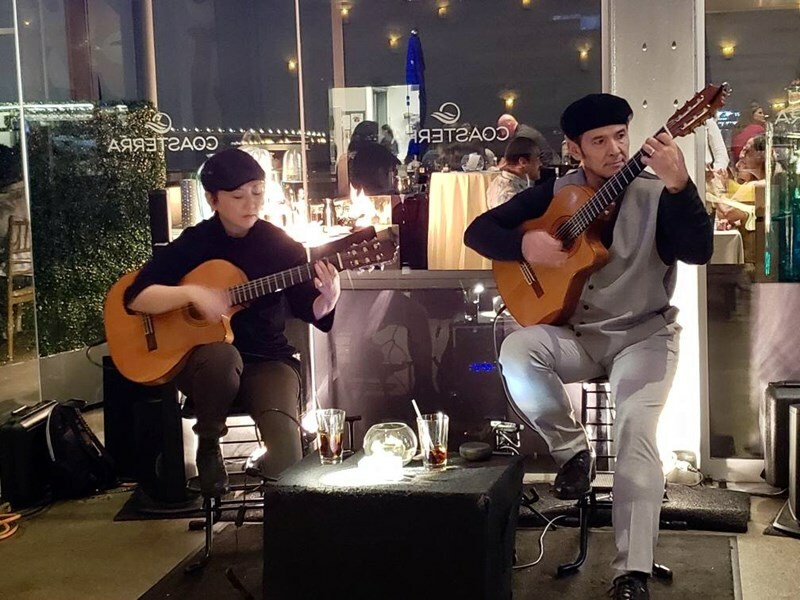 Javid embarked upon the path that would eventually lead to a professional career in music by studying classical guitar at the tender age of 12. Javid studied guitar at the Tehran Music Conservatory in the picturesque and ancient city of Tehran, Iran. The serene and melodic guitar tones proved mesmerizing, and thus imbued his heart and soul with the indelible creative inspiration that would sustain him throughout the road that lay ahead. At the age of 20, having studied classical guitar for 8 years, the young musician emigrated to France, where he made the acquaintance of three gypsy Flamenco guitarists performing along that quintessential "grand avenue" of Paris, the Champs-Elysees, so alive with cafes, concert halls and theatres. Their hauntingly lyrical Flamenco music cast a spell upon the youthful guitarist, an enchantment that would propel him to new horizons. It was while living along the Champs-Elysees that his developing musical style came under the influence of such notable guitar masters as Andre Segovia, Paco de Lucia and Manitas de Plata. The stage was now set, and after five years in France he moved to Munich, Germany, where he lived for a brief period, all the while concentrating on the continuing development and evolution of his own distinctive musical style. In early 2000 the course of both his professional and personal life would forever be altered by a chance meeting with Naoko from city of Hiroshima, Japan. They married in June, 2000 and have become his partners in both life & Music. Naoko has not only proven to be an incredible font of inspiration to his creativity, but has also significantly contributed to his musical endeavors through her own unique talents, both performing with him on the Flamenco rhythm guitar and assisting him in song arrangements. Before meeting Javid, Naoko had never touched a guitar. After watching Javid perform with other rhythm guitarists, Naoko was inspired to learn herself. In 2001, starting with a few tips and techniques from Javid, she slowly eased into the rhythm guitar. One day, when Javid was in need for a new rhythm guitar player, Javid asked Naoko "Why don't you play with me? I think you're ready. " Says Javid: "I never thought Naoko would be such a natural music talent. I've performed with many different players but not one of them could play as good as well as Naoko." They way Naoko holds the strings is very unique. Audiences often comment about Naoko, saying that when she plays the rhythm guitar her hand it's looks like it's dancing, or like she's playing the harp. 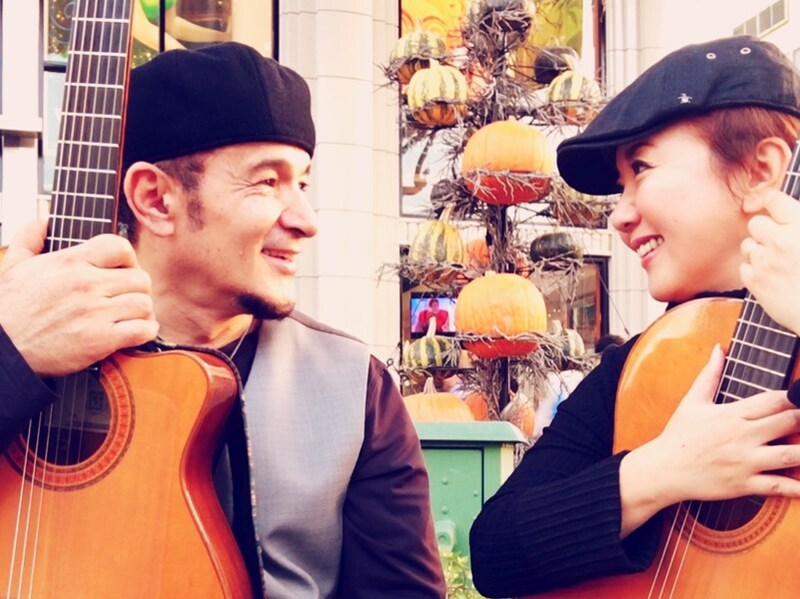 Javid & Naoko have performed at concerts throughout the United States, France, Germany and Japan. They have appeared on San Diego television and their music has also provided background on DVD soundtracks. In 2006 Javid's Flamenco album "SILK ROAD" was sent to 275 radio stations in all around U.S and Canada. Please note Javid & Naoko will also travel to Poway, Rancho Santa Fe, Escondido, Del Mar, San Marcos, Santee, Solana Beach, Cardiff By The Sea, La Jolla, Encinitas, El Cajon, Lakeside, Ramona, La Mesa, Carlsbad, Vista, Lemon Grove, Spring Valley, Oceanside, Valley Center, Alpine, Coronado, Bonsall, Lincoln Acres, National City, Bonita, San Luis Rey, Chula Vista, Pauma Valley, Jamul.